Home Documentation What goal should I track? 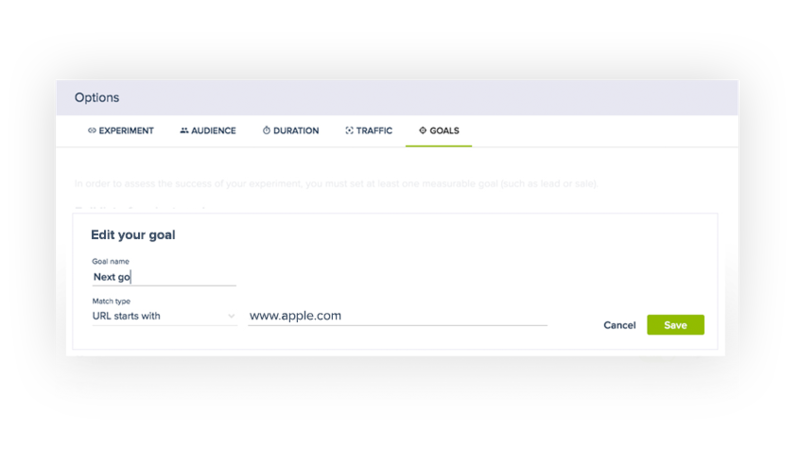 When you want to run an experiment and launch an A/B test, you have to define goals in order to track which variation (original or modified version) works best. Convertize offers the possibility to set two different types of goal. The first one is the Click Goal. This enables you to track specific elements that are clickable and that have just been modified. By tracking these elements, you will be able to see how many people click on them and identify which ones work best. You can set this type of goal by clicking on the element to track and select Track Click on the editing tool (see picture above). The second type of goal is the Page View Goal; this enables you to track the page on which the visitor is supposed to land after the purchase or subscription to validate the conversion. For instance, if you are optimising a category page, you may want to track the product pages or ideally the page after the payment (such as the Thank You page) to track the number of visitors who converted. To set up this goal in the editing room, click on the “Option” button and select “Goals”. You will then be able to enter the URL used to validate the conversion. Which goal should I set? This primary goal is supposed to be the proof that the modification made is bringing a business value to your experiment. Therefore, always try to define what the main objective is (what is the last step visitors accomplish on the website to convert) and which URL or click is representing this conversion.